The base 2009 Dodge Journey is the best value in its lineup. At $19,995, it carries plenty of standard equipment, all the safety gear a family needs, and many of the convenience features families want for road trips. The 2010 Dodge Journey crossover is a mini-minivan and excels in features and safety, but the driving experience leaves a lot to be desired. TheCarConnection.com has prepared this Bottom Line road test summary from firsthand driving impressions. 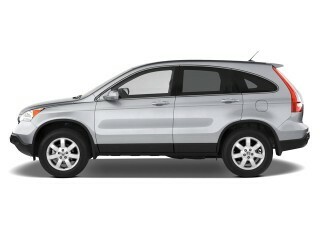 Editors have compared the Journey to other compact crossovers to help you in the shopping process. TheCarConnection.com has also written a companion Full Review, which condenses opinions from other auto-review sites to bring you a comprehensive look at this recently introduced Dodge. The 2010 Dodge Journey is the company's first shot at the crossover market. It combines a wagon body with available all-wheel drive, car-based running gear, and clever minivan-like seating and cargo features. 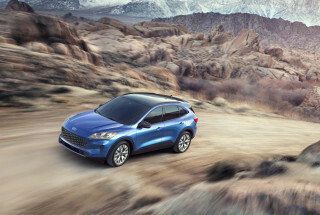 The Journey comes in front- or all-wheel drive, with a choice of four- or six-cylinder engines, options for manual and automatic transmissions, and an available third-row seat. 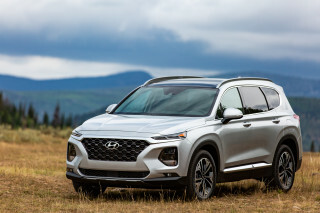 It's priced from less than $20,000 and competes against strong vehicles like the Subaru Forester, Honda CR-V, Kia Sorento, and Hyundai Santa Fe. The Journey brings an edgy Dodge flair to a segment that defaults to a sleeker, softer look. 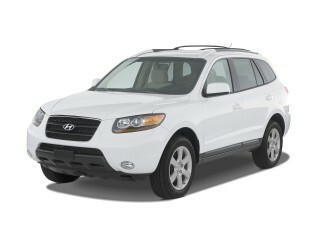 It has more in common with Jeeps, Land Rovers, and Mitsubishi's Outlander than with vehicles like the Hyundai Santa Fe. It works in many ways; the upright crosshair grille is distinctive, the silhouette is trim, and it's tall enough to be functional, though it seems a little narrow from some angles. Clearly it's a wagon, but one tending to the SUV spectrum of styling. The Journey's interior falls far below the best in the class, however. The instruments are canted at a strange angle and have a dated typeface. The straight-edge style doesn't play as well on the Journey's dash as it does its sheetmetal and looks less expensive than the Journey can be. 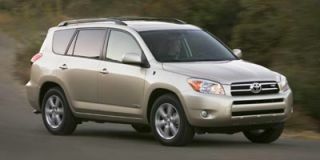 The 2010 Journey's drivetrains are less than inspiring, and its handling is reasonably responsive in front-drive versions, while all-wheel-drive wagons can feel sluggish. The 173-horsepower four-cylinder is a flat performer, and the 235-hp V-6 isn't much more encouraging in low-speed driving, though it's much more capable of passing maneuvers with less noise and angst. Steering comes in two flavors: The front-drive Journey has a little torque steer-the tugging motion under hard acceleration-but is quick and light if not sports-car-accurate. All-wheel-drive Journey wagons require more steering muscle and give less feedback. Ride quality is good, though, with the proper damping and roll control for a family vehicle. Fuel economy hits 19/25 mpg on four-cylinder models, and the V-6 front-drive Journey isn't far behind at 16/24 mpg. The V-6 with AWD drops to 15/23 mpg. A fuel-saver indicator is now installed for frugal, observant drivers, but all figures are below newer class entries like the 2011 Kia Sorento. Braking is strong, and wheel sizes range from 16-inchers on base vehicles up to optional 19-inchers. The Journey is a functional place for bigger families-just not too big, please. The seats are flat but are given enough head- and legroom in both the front and in the second row. The optional third-row bench is for two children, max. The second row slides for more legroom, and front seats have storage built in beneath the seat cushion. If you're shopping the next larger class of crossovers-Highlander, Edge, Murano, and Pilot-the Journey will seem like a tighter fit, but it's as roomy as the Honda CR-V. Interior storage is a coup for the Journey, which has lots of bins and cubbies under the seats and between passengers, as well as in its door panels. The cargo hold is a big 37 cubic feet behind the second row and 10.7 cubic feet behind the raised third-row seat; with only the front two seats raised, it's a usefully large 67.6 cubic feet. Safety is a strong selling point for the 2010 Dodge Journey. NHTSA (National Highway Traffic Safety Administration) gives it five stars for front and side impact protection and four stars for rollover protection. The IIHS (Insurance Institute for Highway Safety) calls it a Top Safety Pick. Standard safety equipment on the 2010 Dodge Journey includes dual front, side, and curtain airbags; stability and traction control; and new for 2010, active head restraints and four-wheel disc brakes with anti-lock control on all models. A rearview camera is available, as are integrated second-row child booster seats. The 2010 Journey offers a class-beating set of available entertainment features. However, those options add up and you could spend $35,000 by specifying all of them. Standard features include air conditioning; cruise control; power locks/mirrors/windows; a cooled glove box; a telescoping steering wheel; and an AM/FM/CD player with MP3 capability. Options include a navigation system; Sirius Satellite Radio and Sirius Backseat TV, an on-the-go service with a small selection of kid-friendly programming; a DVD entertainment system; and a premium audio system and uConnect multimedia with MP3 player controls. The 2010 Dodge Journey draws attention with upright styling, but needs a revamp in its plasticky, awkward interior. 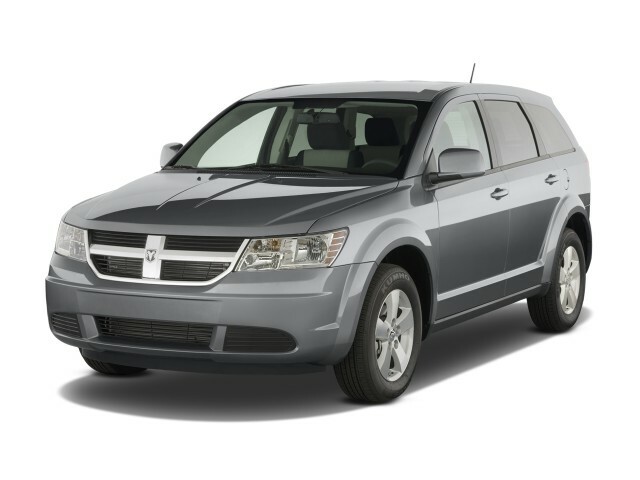 The 2010 Dodge Journey brings an edgy Dodge flair to a segment that defaults to a sleeker, softer look. The Journey doesn't fit the more usual sleekness of the crossover class. 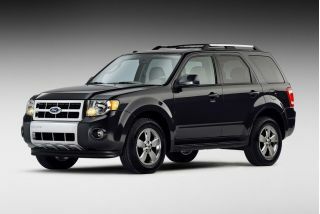 It has more in common with Jeeps, Land Rovers, and Mitsubishi's Outlander than with vehicles like the Hyundai Santa Fe. Clearly it's a wagon, but one tending to the SUV spectrum of styling. Edmunds says "the overall impression is of a bright, reasonably spacious, straightforward family hauler," while Cars.com comments it "looks like a full-grown Dodge Caliber." The style works in many ways: The upright crosshair grille is distinctive, the silhouette is trim, and it's tall enough to be functional, though it seems a little narrow from some angles. As Car and Driver remarks, "the Journey is a relatively good-looking vehicle with a solid stance, an elegant tapered greenhouse, and a square-jawed mug." The Detroit News is a little backhanded in its compliments, commenting "its profile is less polarizing than other Dodge vehicles," while wagering "nondescript isn't a bad thing either." The Journey's interior falls far below the best in the class, however. The instruments are canted at a strange angle and have a dated typeface. The straight-edge style doesn't play as well on the Journey's dash as it does its sheetmetal and looks less expensive than the Journey can be. Truck Trend half-praises it as "kind of nice," but Edmunds says "its interior is less refined than those found in competitors." Road & Track remarks "the interior execution, which, while an improvement for Dodge, is still a far cry from being superb. The gauges have a 1980s look with square housings and glass partitions." Car and Driver reports, "The instrument cowl has a fun retro style to it-think '80s-vintage LeBarons-but the lack of graining on the plastic stands out as much as the cheeky design." The Detroit News observes "controls are all easily and intuitively within reach," though it notes the gearshift sits on the center console in a slightly awkward spot. ConsumerGuide likes the Journey's "generally handsome cabin decor," but it doesn't care for the way the steering wheel "partially blocks view to dials to the far left and right." They add with the base audio system, "all audio controls are set too low for easy access." Performance is the least competitive aspect of the 2010 Dodge Journey. The 2010 Journey's drivetrains are less than inspiring, but its handling is reasonably responsive in front-drive versions. However, all-wheel-drive wagons can feel sluggish. The 173-horsepower four-cylinder is a flat performer, and the 235-hp V-6 isn't much more encouraging in low-speed driving, though it's much more capable of passing maneuvers with less noise and angst. ConsumerGuide says the four-cylinder Journey "keeps up with urban traffic acceptably well," but Edmunds feels it isn't "quite up to the task of motivating the hefty SE's 3,800 pounds with anything close to authority." The Detroit News compares it to the Little Engine That Could: "I think I can, I think I can make it up this hill." The V-6 isn't much improved; it "has decent power but isn't the quickest thing on the road," Cars.com notes, though the Detroit News "never felt a need for more juice." Shifting is acceptable: ConsumerGuide warns that V-6 versions "were prone to overly abrupt downshifts during brisk acceleration." Fuel economy hits 19/25 mpg on four-cylinder models, and the V-6 front-drive Journey isn't far behind at 16/24 mpg. The V-6 with AWD drops to 15/23 mpg. Cars.com calls those figures "paltry." A fuel-saver indicator is now installed for frugal, observant drivers, but all figures are below newer class entries like the 2011 Kia Sorento. When it comes to handling and ride, the Journey fares a little better. It's "tranquil enough," Edmunds says, but its body roll in corners is "disconcerting at times." Cars.com notes that the sport-tuned suspension and 19-inch wheels keep the ride motions damped, "but not body lean in corners. Forget pinpoint handling..." Steering comes in two flavors: The front-drive Journey has a little torque steer-the tugging motion under hard acceleration-but is quick and light, if not sports-car-accurate. All-wheel-drive Journey wagons require more steering muscle and give less feedback. Ride quality is good, though, with the proper damping and roll control for a family vehicle. ConsumerGuide reports that all versions of the 2009 Dodge Journey "filter out road imperfections with commendable ease," but base SE models "are prone to float over larger dips and swells." Braking is strong-"capable but unremarkable," in the words of Car and Driver-and wheel sizes range from 16-inchers on base vehicles up to optional 19-inchers. TruckTrend is alone in noting that the Journey can tow 3,500 pounds, not much less than the much larger Dodge Grand Caravan minivan. The 2010 Dodge Journey has ample room and clever storage features, but suffers in execution. The Journey is a functional place for bigger families-just not too big, please. If you're shopping the next larger class of crossovers-Highlander, Edge, Murano, and Pilot-the Journey will seem like a tighter fit, but it's as roomy as the Honda CR-V. The seats are flat but are given enough head- and legroom in both the front and in the second row. The second row slides for more legroom, and front seats have storage built in beneath the seat cushion. The Detroit News awards kudos for the wide-opening rear doors: "anyone who has had to lift up a child and strap them into safety seat will appreciate the second-row doors that open out 90 degrees." The optional third-row bench is for two children, max. Cars.com notes that the third row is "strictly for little kids," and with the third-row seats raised, "there isn't a lot of room behind them." Car and Driver calls it "emergency-size" and deems it fit only for "carpool day." Interior storage is a coup for the Journey, which has lots of bins and cubbies under the seats and between passengers, as well as in its door panels. Every review TheCarConnection.com's editors read compliment the Journey on its extreme functionality and use of space. The Journey "excels on the inside," Edmunds reports. It's "loaded with clever, well-conceived minivan-style conveniences" like a cooled glove box for sodas, all those storage bins in the floor and door panels, and an iPod holder in the center console. Car and Driver points out the "most unique aspect of the vehicle by far: the standard, removable underfloor cooler/storage bins that can hold a dozen cans of soda-on ice-without leaking." AutoTrader notes its Tip 'N' Fold seats in the second row "provide quick access to the back with the turn of a lever," and that "both second-row seats and the front passenger seat fold to form a flat load surface." Cars.com appreciates that "the seat backs fold flat at the pull of a strap to dramatically expand cargo space." However, they find it odd that the "liftgate is manual only," whereas many crossovers offer a power liftgate. The cargo hold is a big 37 cubic feet behind the second row and 10.7 cubic feet behind the raised third-row seat; with only the front two seats raised, it's a usefully large 67.6 cubic feet. Interior quality is a major letdown in the Journey's functional interior. Car and Driver says the Journey has "an ambience about as cheerful as a prison cell fashioned from Tupperware." ConsumerGuide points out the Journey's "excessive use of hard plastics and unpadded materials." TruckTrend finds the Journey's "noise, vibration, and harshness characteristics are good," but considers the four-cylinder rougher than most modern designs. Not yet crash-tested, the 2010 Dodge Journey has all the safety gear you'd expect-and then some. Safety is a strong selling point for the 2010 Dodge Journey. For the 2010 model year, NHTSA (National Highway Traffic Safety Administration) awards the Journey five stars for front and side impact protection and four stars for rollover protection. The IIHS (Insurance Institute for Highway Safety) calls it a Top Safety Pick. Standard safety equipment on the 2010 Dodge Journey includes dual front, side, and curtain airbags; stability and traction control; and new for 2010, active head restraints and four-wheel disc brakes with anti-lock control on all models. A rearview camera is available, as are integrated second-row child booster seats. The Detroit News adds that trailer-sway dampening and tire pressure monitoring are "refreshing" standard features. No crossover can match the 2010 Dodge Journey's extensive list of entertainment features-though they can boost the price tremendously. The 2010 Journey offers a class-beating set of available entertainment features. However, those options add up and you could spend $35,000 by specifying all of them. 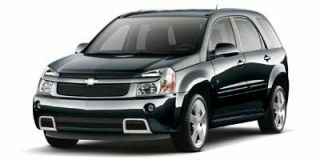 The SXT version adds a power driver seat; keyless entry; a 115-volt power outlet; and satellite radio. The top R/T edition gets 19-inch wheels; dual-zone climate control; leather upholstery; heated front seats; and remote start. The available power outlet can be shut off by the driver, which The Detroit News calls a "convenience" that can protect curious children from shocks. Other major options, Cars.com adds, include Bluetooth; a rear air conditioner; a rear-seat entertainment system; and Chrysler's MyGIG navigation and entertainment system with a backup camera. The Journey is the only crossover offered with Sirius Backseat TV, an on-the-go service with a small selection of kid-friendly programming. This year, the LCD screen for the DVD entertainment system and BackseatTV grows to nine inches in diagonal width.